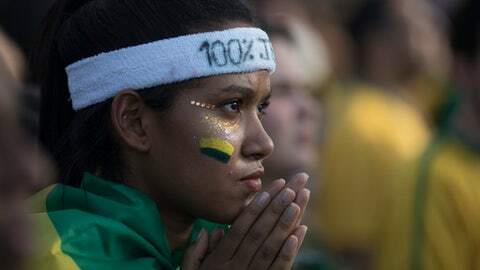 RIO DE JANEIRO (AP) Disappointment and frustration swept over Brazilians who gathered at public squares, bars and parks across Latin America’s biggest country to watch their national team end up with a 1-1 tie in its opening World Cup match. In Rio de Janeiro, thousands jammed the downtown Maua Square to watch Brazil’s game with Switzerland on large TV screens. People cheered wildly when Brazil made it 1-0. But the mood started declining into glumness once Switzerland scored the equalizer and Brazil failed to get in another goal. People watching the game in Sao Paulo, Belo Horizonte and other cities in soccer-mad Brazil expressed similar feelings of disappointment.